We are happy to present Guilford of Maine's new acoustic, panel and seating fabrics featuring new styles, colors and textures! As the recognized leader in acoustic fabrics, Guilford of Maine is happy to present new design-driven, acoustically transparent fabrics. Emphasizing texture, natural fiber looks, and rich, strong colors, this introduction helps to create more inviting and comfortable environments. We're excited to introduce 5 new patterns into Guilford of Maine! All are contemporary additions to our line. Two are for upholstery applications and three are panel fabrics. Read on to see them all and order a free sample. Since the middle of the last century the office environment has evolved from private offices to cubicle farms to open office. Now in 2017, we are working in spaces that combine collaborative areas encouraging interaction with private spaces allowing for focus and introspection. With 24/7 connectivity we are also seeing the integration of the personal and the professional, the home and the office. Today’s workforce prefers a more useable, approachable, and comfortable feel to their work spaces – more and more like their homes. 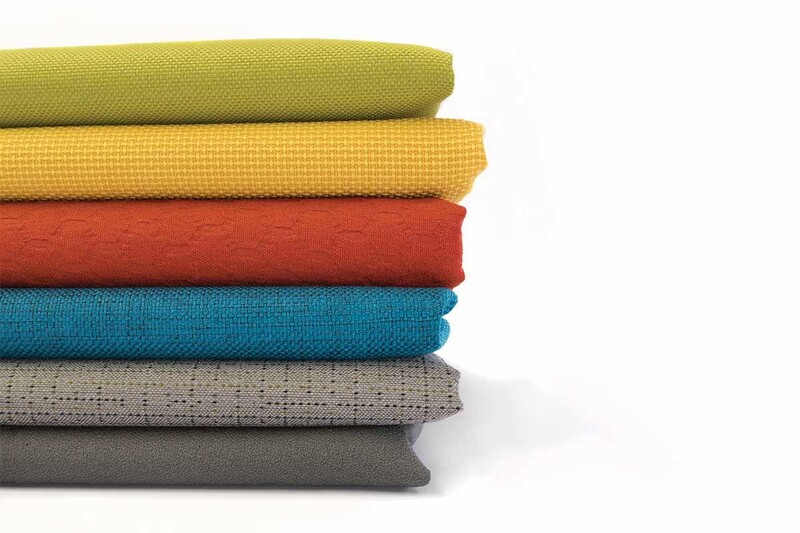 This diverse and dynamic collection of nine upholstery fabrics with 117 colorways speaks to the way we work today. 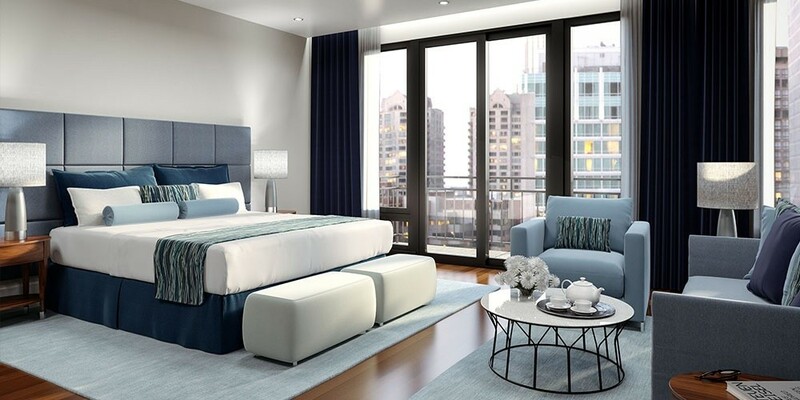 We need highly functional and durable fabrics that work in a variety of environments and on a range of furniture pieces to soothe or energize, inspire or connect. Encompassing a range of colors, textures, and patterns these fabrics have the look, value, and performance to work anywhere, anytime just like our new work style. Below is more information on each pattern. To see the full colorline and order free samples, click the links below. 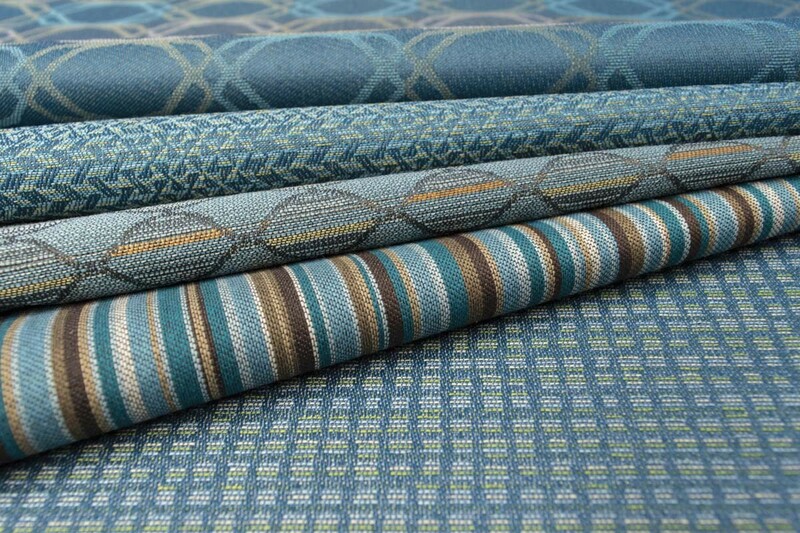 The “Wants & Needs Collection” is 5 new Crypton Green upholstery patterns from Guilford of Maine. The collection has the range of coordinating, useable upholstery patterns with current trend colors that you want along with the performance of Crypton Green that you need. Time for new products! We've just launched Intuition, a brand new multi-purpose fabric as well as new colors to our popular BeeHave and Framework patterns. Read on to see them all, learn more about them and order a free sample. As a follow up to our warm color story we are excited to share with you the other side the spectrum with a range of "cool" upholstery fabrics. It's not even the middle of January and already 2016 feels like ages ago... Nevertheless, the beginning of a new year is always a good time to reflect on where we have been, where we are, and where we are going. 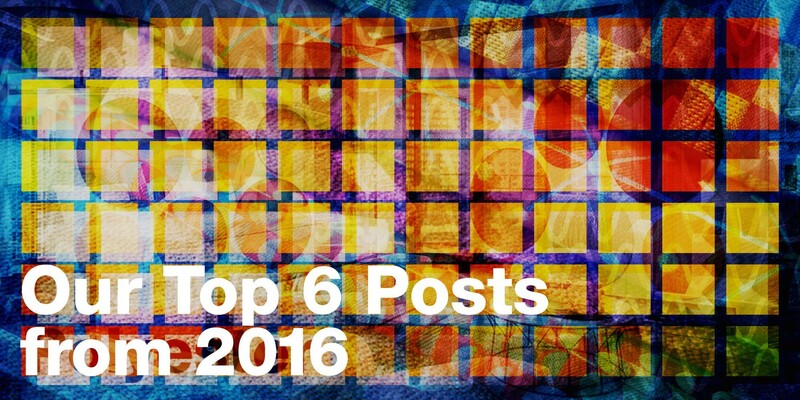 While we've got a lot of great things lined up for the coming year, let's to take a few minutes and look back at our most popular blog posts from 2016. Click on the images or links below to read the full posts! 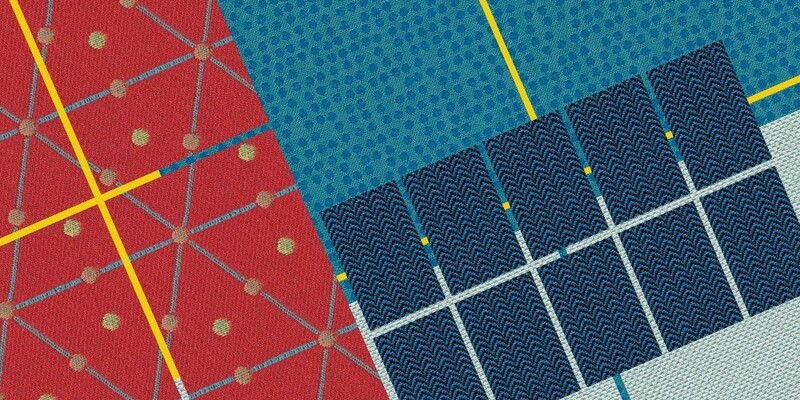 We're excited to introduce 3 new patterns into Guilford of Maine! All are bright, contemporary additions to our line. 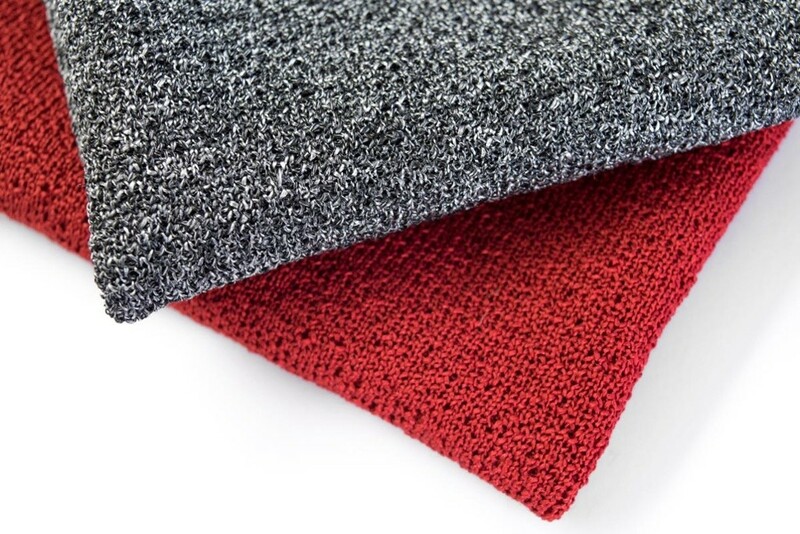 2 are multi-purpose fabrics for upholstery and vertical surface applications and one is a panel and acoustic fabric. Read on to see them all and order a free sample. It's probably not a surprise that we love color here at Guilford of Maine. One of the greatest parts of working in textiles is being surrounded by all the colors and textures that we have to offer. There are currently well over 1,000 colors to choose from in the Guilford of Maine product line! So if you love color as much as we do, or just have a slight affection, check out our latest color story for a little inspiration, which covers the warm part of the color spectrum. Did you know that the same machine that is used to knit sweaters and shoes is also used to knit fabric for furniture? 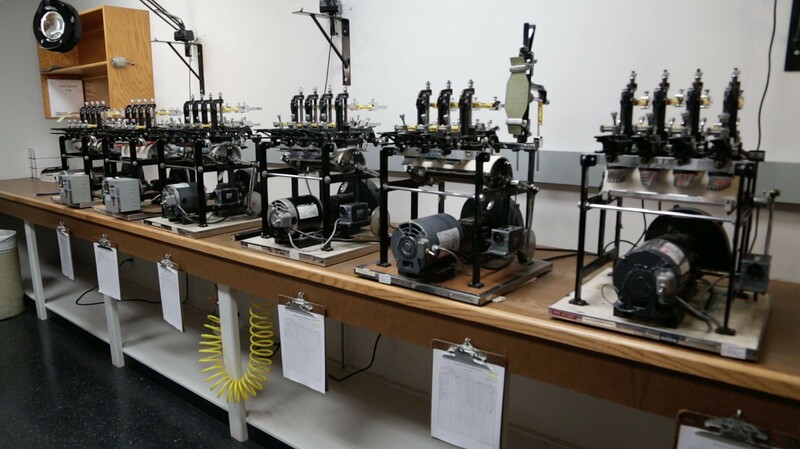 These versatile machines are able to knit a variety of different products and shapes that fit the contours of a chair, and are all knit at our facility in Grand Rapids, Michigan. Read on to learn how this process works and its capabilities. Yes, it's true. Most of the recycled polyester we use originates from plastic water and soda bottles. 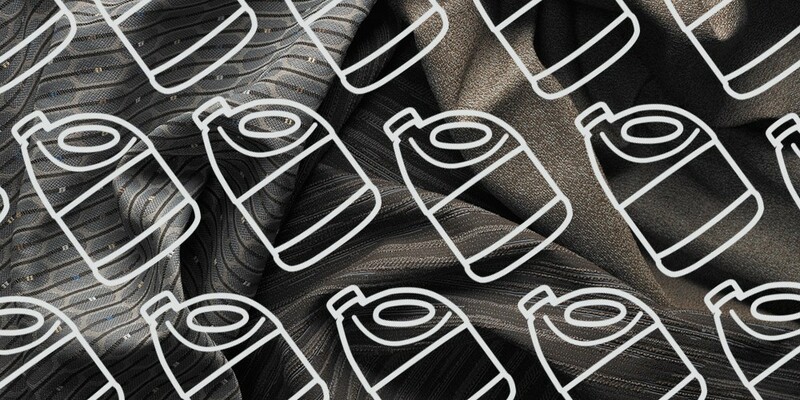 While it sounds pretty unbelievable that a hard drinking container can turn into soft fabric, it's actually a relatively simple process and is used often in our industry as well as the clothing industry. 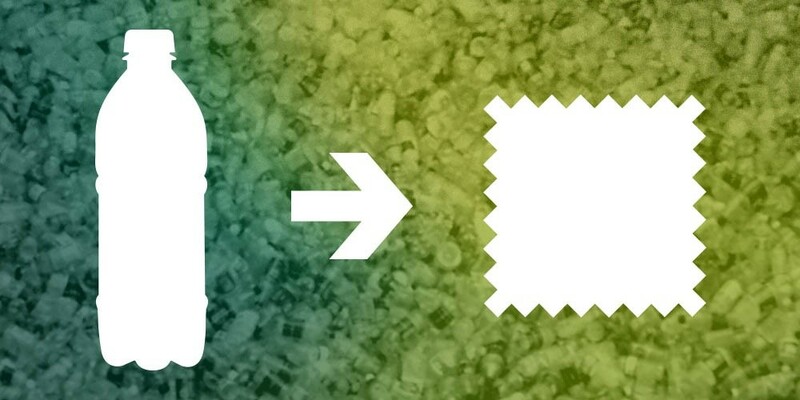 This is the story of how a plastic bottle is turned into fabric. When we purchase anything, whether it is a piece of clothing or a piece of furniture, it is easy to overlook where that product is made. It's easy to forget about all of the processes, people, expertise, resources and energy it took to get it into your hands. A lot of fabric is made overseas, but let's examine some of the drawbacks and why we think it's beneficial to purchase textiles made in the USA and Canada. What makes a fabric something that is made for you to sit on instead of something to wrap a panel with? Or hang in a hospital? Are the fabrics really all that different? The answer is yes and no, as we will explain in this post. The spaces we move through, work and live in can have strong invisible and subconscious affects on how we feel, act and react. For example, in an airport, the tile patterns, signage, angle of desks, sizes of doorways and lighting can all subconsciously lead people in certain directions, making it harder to get lost and easier to find our gate. Or more likely to buy a snack. We aren't even consciously aware of these forces, and yet they exist. As designers we have the opportunity to shape how people experience the world around them. When designing a space, choosing colors of fabric, paint, and other surface materials is a crucial task to making a room look great. As a follow up to our recent posts about the color wheel and color palettes, I thought it would be interesting to share the Farnsworth Munsell color test. It helps answer the question "is what I am seeing what other people see?" 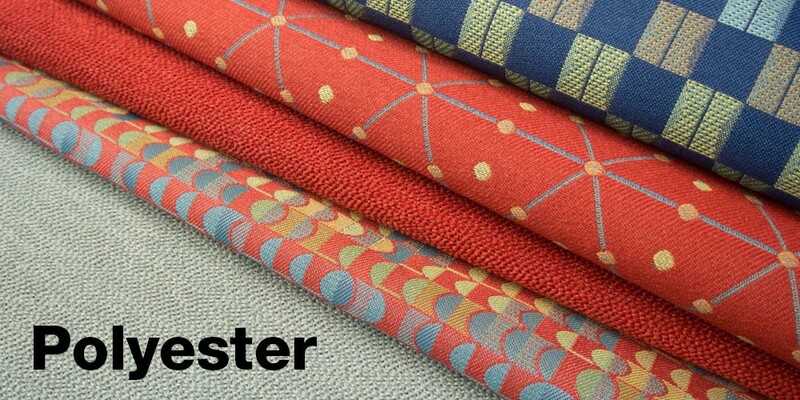 Polyester is the most common and versatile fiber type that we weave fabric with in our mills and most of our upholstery, panel/acoustic and cubicle fabrics are woven out of polyester. In this article we will cover what polyester is, where it comes from, and its advantages and disadvantages. Now that we've got the basics of the color wheel down (see previous post here), we can move on to how to use it! There are 7 main color relationships that we are going to cover, plus neutrals, in this post. 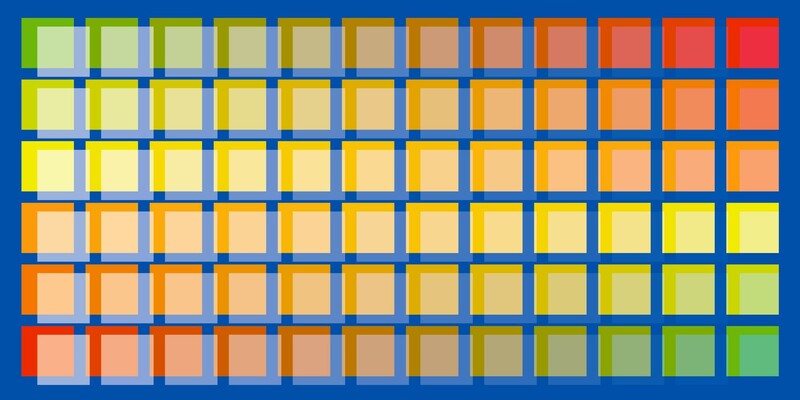 Knowing these color relationships can help you unpack the mystery box that color palettes can sometimes be. 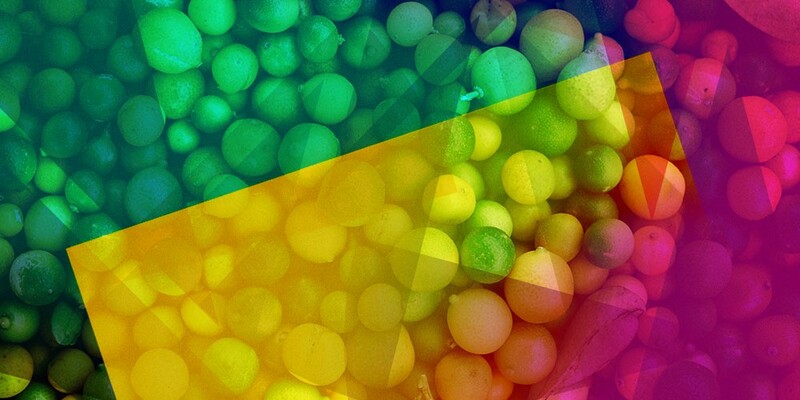 It is obvious to all of us that the world is a colorful place (unless you are some of the people living here) and consciously or subconsciously, we are all aware when something looks just *right* or when something feels off when it comes to color. Why is that? What is it about some color pallettes that work so well, and how do you replicate yourself? If you are a full-time designer, this post will probably be more like a reminder (I know I need it sometimes). To those who aren't designing spaces every day, color theory can feel abstract, but with a little learning, you too can know the basics. 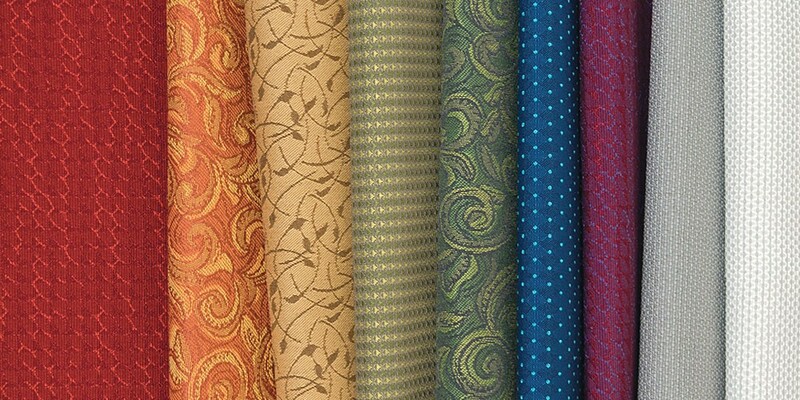 We've updated 4 classic Upholstery patterns with new colors and we are also introducing 2 new Panel & Acoustic patterns. All 4 Upholstery patterns come standard with a stain repellent to keep them looking beautiful. Both Panel & Acoustic patterns have been third-party tested for acoustic transparency and all 6 patterns are made from 100% recycled polyester, woven right here in the USA. Read on to see them all and order a free sample! We all know the saying "a rendering is worth a thousands words" (right? ), but if you don't have the images to make the rendering, then it isn't worth any words. That's why we are working hard to create rendering images of all our textiles so the next time you are toiling away on your latest awesome project that uses Guilford of Maine textiles, you won't be left empty handed when it comes time to really wow your client. The interplay of lighting, color and texture can have a profound impact on how a finished space looks and feels. That's why it's important to take lighting into consideration when choosing the colors and textiles for the space you are designing. Whether a room has lots of daylight, or you are relying on artificial light sources, the color in a room can look different depending on the light source. This can drastically change the color and appearance of fabric and other finishes in a room. Before you grab a gallon of bleach and starting pouring it over your bleach cleanable Upholstery fabric, you may want to read this article. 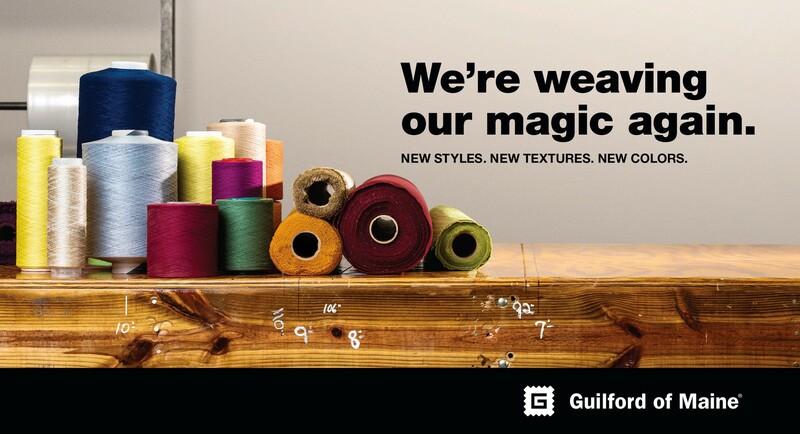 We are very excited to announce the beginning of a new future for True Textiles, Guilford of Maine, and Teknit. Duvaltex Inc., a holding company based in Quebec Canada, specializing in textile innovation and development, has acquired our company. 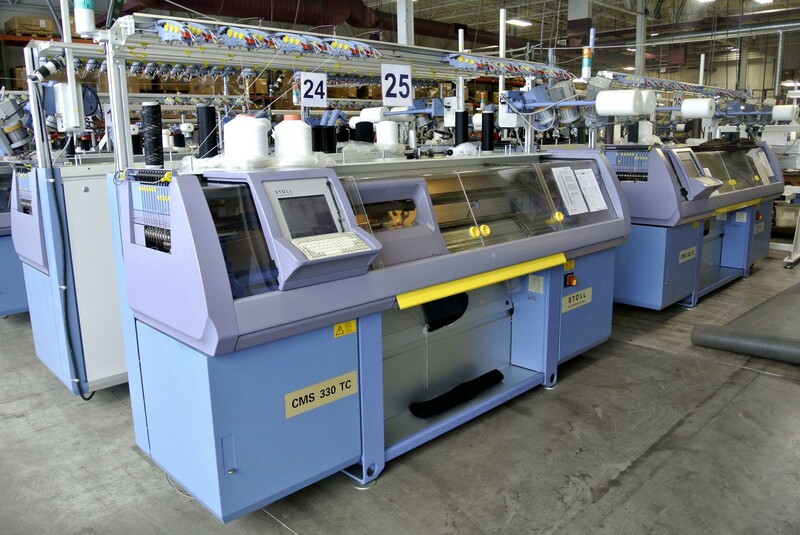 Duvaltex also owns Victor Textiles, Inc., a leading North American textile manufacturer. 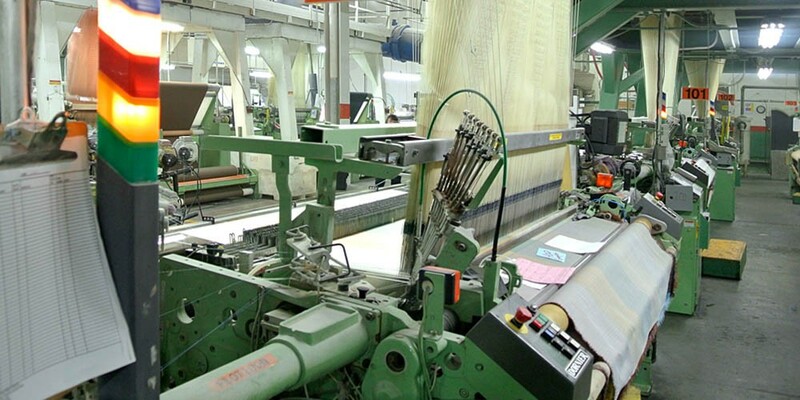 True Textiles and Victor Textiles will continue to operate as independent business units. 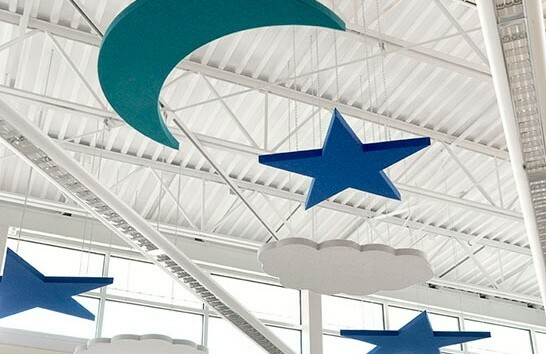 "This acquisition brings together two of the industry's most established and successful companies, recognized for their dedication to innovative product design and commitment to sustainability," stated Alain Duval, president of Duvaltex Inc. "The True Textiles brands are respected worldwide, and we are looking forward to continuing to maintain that reputation, while exploring new opportunities for growth and diversification. We believe customers of all of the brands will see the benefits as we move forward to this exciting new chapter for both companies. "We invite you to join us in celebrating our new beginning. 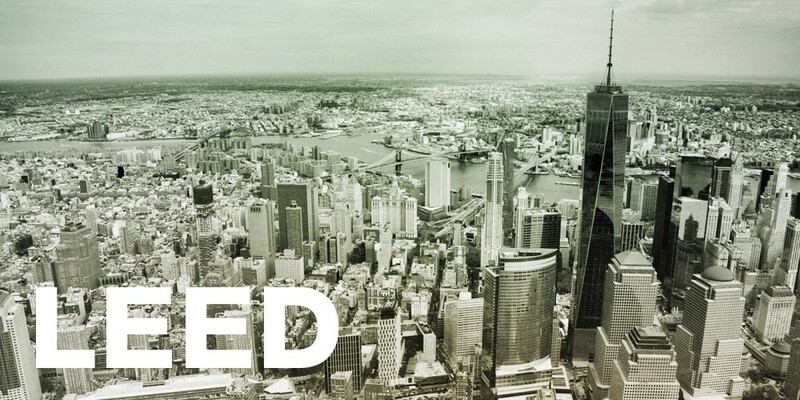 The process of achieving LEED certification can be like trying to navigate a big city. While textiles are but a small portion of the LEED cityscape, we want you to have all the tools we can provide to make your life easier. It's that time of year again for winter snow storms for us in the frigid north. 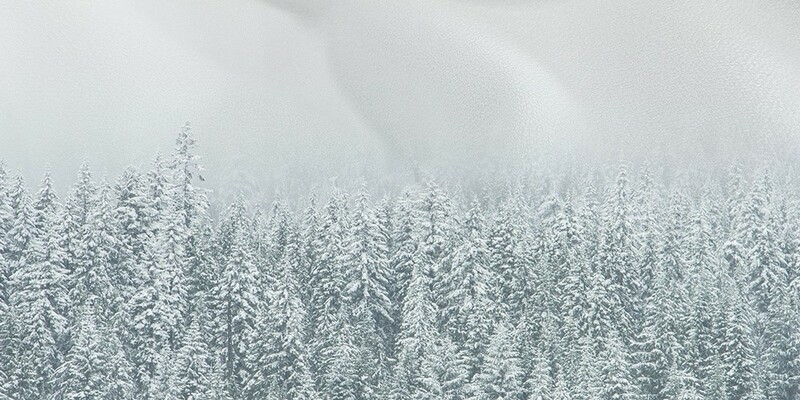 Using all of this winter weather as a starting point, I thought I'd highlight some of our Panel and Acoustic fabrics that are as white as, you guessed it, snow. 2015 marked the 150th anniversary of our mill in Guilford, Maine where we still weave our fabric today and it was our first year with a blog. 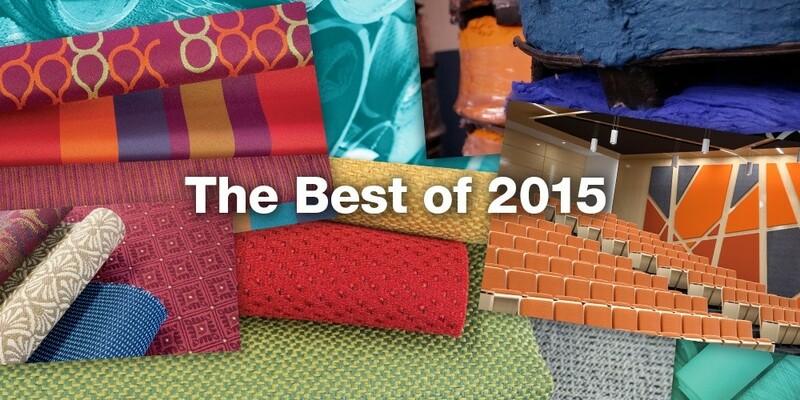 It's always nice to take a look back at the year that was, so here are some of our most popular posts from 2015. 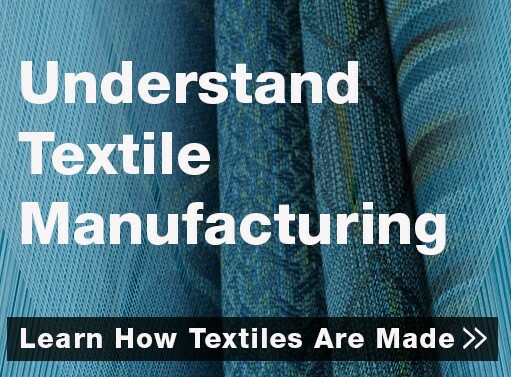 On our blog we strive to provide you useful content from the world of textiles in order to make your job easier and we will continue to pursue that goal in 2016! You may have heard the terms Jacquard and dobby in reference to fabric, but do you know what it means? In this post, we'll broadly cover the differences between these two types of looms. We’ve updated 2 of our classic Upholstery patterns with new colors and we are very excited to introduce 4 new bright and bold Upholstery patterns. All 6 come standard with our proprietary BLOCKaide® stain repellent to protect against the mess of life. All patterns except Famous are made from 100% recycled polyester, and all except one pattern pass the Wyzenbeek abrasion test with over 50,000 double rubs. Whether you're looking for something subtle and sophisticated or bright and bold, we've got you covered. And they're all made right here in the USA. Let's say you have a spill, and your fabric is bleach cleanable. Should you run for the bleach and give it a good pour on the problem area? No! Read on to learn how you should actually clean bleach cleanable upholstery. And straight bleach isn't the answer. The processes of making textiles can be, well, a little bit complicated. There are a lot of different steps that have to come together in order to make your chairs, acoustic panels, lounge seating, cubicle panels or anywhere else you stick fabric look and perform great. Some of us are visual learners, so we put together a handy infographic to give a broad overview of what the process looks like at our mills in Maine and North Carolina. Fabrics Shown above - Seating: Sketch. Acoustic Panels: Gray, FR701. Light orange, BeeHave. Dark orange, Highbeams. There are many options for covering acoustic panels, but whether you are looking to cover some panels for your basement theater or fill an auditorium, there are a few things to keep in mind when choosing which material to cover the acoustic panels with. 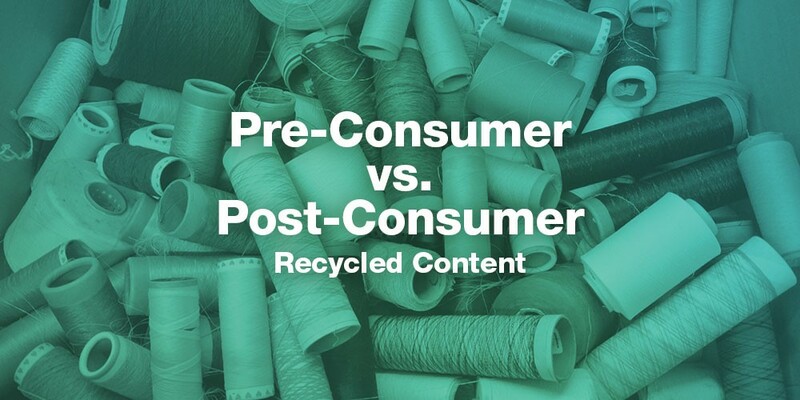 When it comes to recycled content in fabric, all is not created equal. Pre-Consumer, Post-Consumer, Post-Industrial and Recycled are all terms used in the content listing of textiles but mean different things. In order to celebrate or perhaps bemoan the start of another school year, we put together a collection of 12 upholstery patterns that will stand up to the wear and tear of an educational environment. However tempting it may be, whether you're in a time crunch to get a project completed, or you think it will be close enough, don't specify a textile based on an image on a screen, or a printed image. Read on to find out why. How Does Fabric Get Its Color? You have probably heard the terms "piece dyed" or "yarn dyed" thrown around, but do you know what those terms mean and how it affects the fabric? 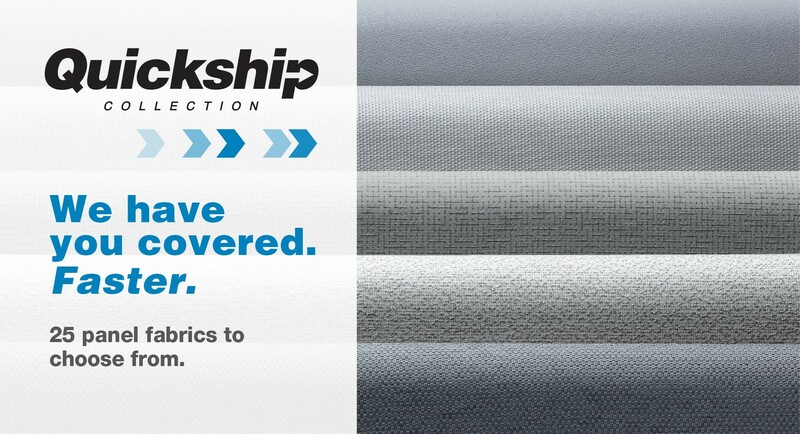 We are excited to announce that we have just launched 7 new Upholstery patterns and 5 new Panel & Acoustic patterns. All of the Upholstery products (except the Teknit knit) come with our BLOCKaide Stain Repellent and are all 50,000+ double rubs. Also, all the Panel & Acoustic products have been acoustically tested by a third party and are equally at home on a cubicle panel or an acoustic panel. But enough chit chat, I'll let the photos do the talking. Have you ever wondered what it means when a fabric specification says "pattern shown railroaded"? What does it mean when a fabric is railroaded? What Are ACT Symbols and What Are They Useful For? As a designer or specifier, you've probably seen these symbols around while browsing textile websites, but do you know what they stand for and how can they make your job easier? Read on to find out. Being a textile in a Healthcare environment can be a tough job, unless it's up for the challenge. 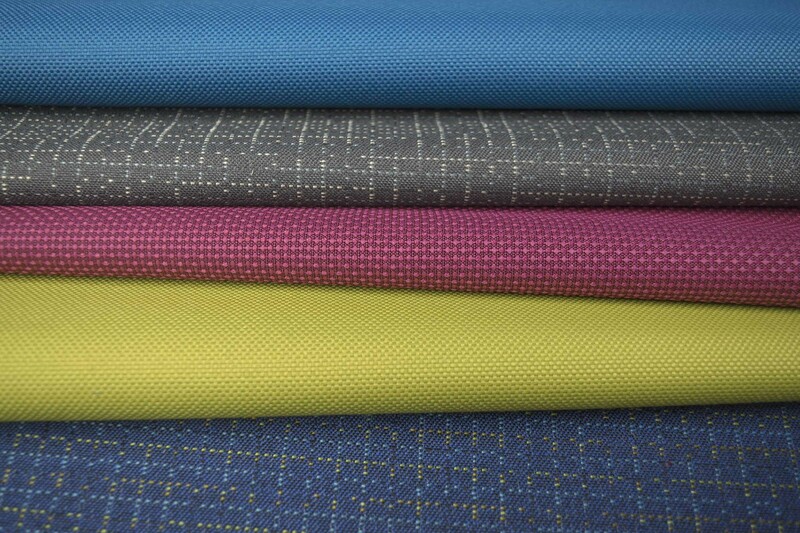 Our collection this month is a small sampling of our overall collection of high performance textiles that look and perform great in a Healthcare setting, whether that be in a Hospital waiting room, patient room, or an assisted living facility. 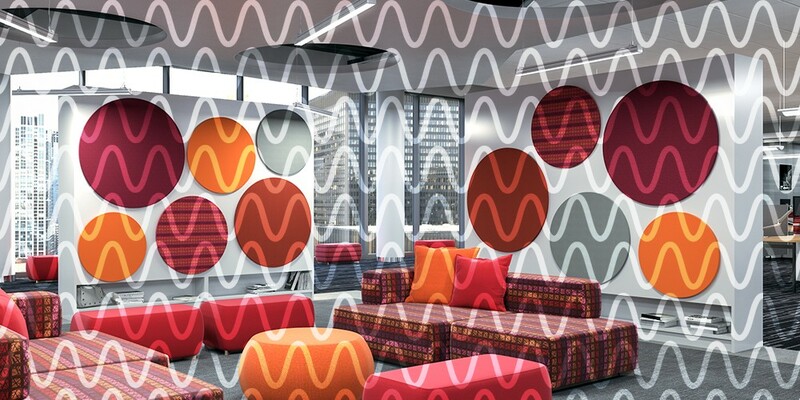 What do you when you want to use a fabric for acoustic panels, but don't have the data to know whether it will result in peaceful bliss or a cacophony of noise? Sometimes an old fashioned trick is just what you need in a pinch. This month we put together a collection of acoustic fabrics from our entire group of acoustic patterns that go beyond classic FR701. Check it out, let us know what you think, and order a free memo set of this collection! Acoustics matter, but if you aren't an Acoustician or a Sound Engineer, where do you even start when thinking about acoustics in the space you are designing? This post will cover some of the basics of what to consider for the acoustics of a space, acoustic panel basics and what makes a good acoustic fabric. We all know that certain color palettes and patterns are more appropriate for particular settings than others. This month's collection of Upholstery, Drapery and Panel/Acoustic fabrics were chosen to coordinate beautifully and work well specifically in House of Worship settings. 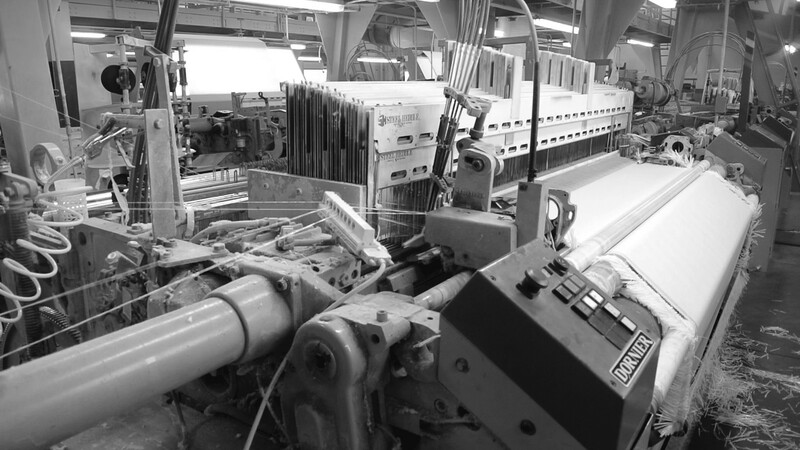 Most of you probably remember weaving some yarn together on a piece of cardboard in grade school, but what does a state-of-the-art loom look like that can weave hundreds of yards of upholstery, panel, acoustic or cubicle fabric a day? Check out our brief video on weaving showing how it's done. We all know the best way to keep upholstery clean is to not have anything spill on it. But this is the real world, where dirt and spills are bound to happen. Luckily, there are stain repellents. What a textile is made of can make a huge difference when it comes to performance, durability, cleanability and where it should be used. Using a textile with the wrong content can result in poor performance in the field. In this post we'll talk about Olefin. What it is and its benefits and disadvantages. The Traditional style is comforting and classic. The hallmarks for it generally include deep wood tones, architectural details, and elegant furnishings. Rich wood tones, like those found in cherry, maple, and mahogany, are a key element in this style. Architectural embellishments such as elaborate moldings, beveled wood paneling, and intricate tile and wood floor patterns are widely used. One of the most important facets of traditional design are the lines of the furnishings that often harken back to the 18th and 19th centuries. But what do you do if the “traditional” Traditional is a bit too stodgy? Modern is too sleek? Transitional too eclectic? 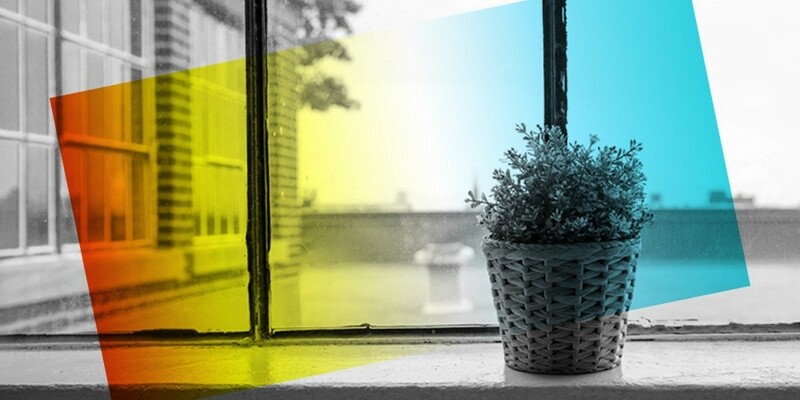 Color plays an important role in every environment – they make us feel happy or sad… they can make us feel angry or relaxed. 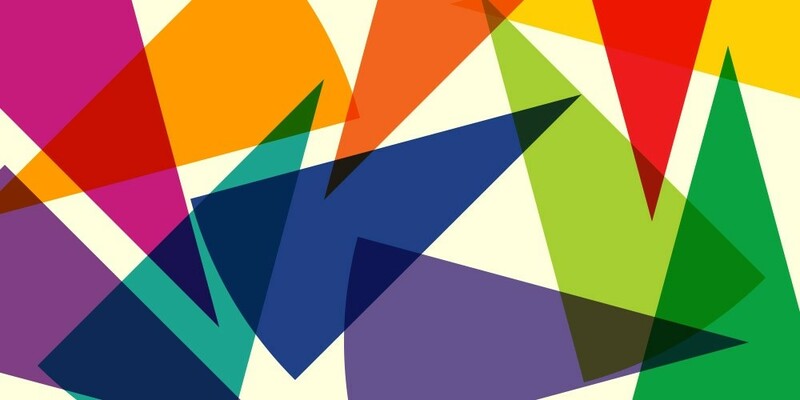 As we all know, it’s important to understand the psychological effects colors might have on an average person, or our client’s target audience. 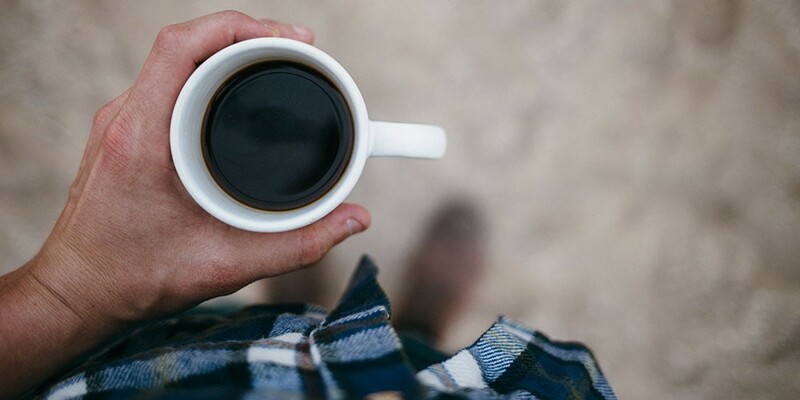 When that need calls for a calm experience, it's always nice to turn to neutrals.